That’s a knee-jerk reaction, much like when Spanish designer Mango vowed not to use mannequins smaller than a size 6 because of “problems with eating disorders among Spanish Women”. 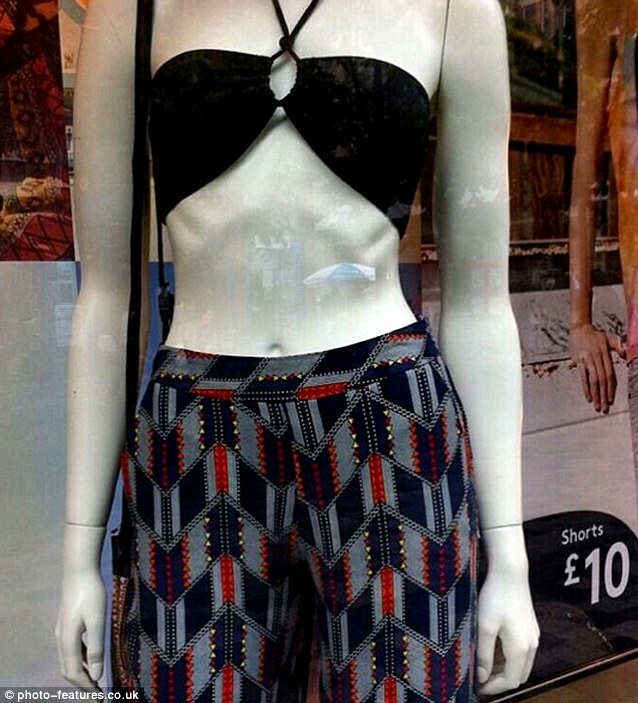 Removing mannequins with protruding hips or visible ribs isn’t the solution. After all, there are lots of women whose bodies look like those mannequins and they’re neither anorexic nor unhealthy. Removing them sends the message that those bodies are wrong… is that really what we want them to say? Using mannequins of varying sizes, shapes and abilities would go a long way toward encouraging positive body image and acceptance. If no one body were held up as the “ideal”, there might be less anxiety about “promoting eating disorders or unhealthy lifestyles” which are the usual arguments against slender and fat mannequins. 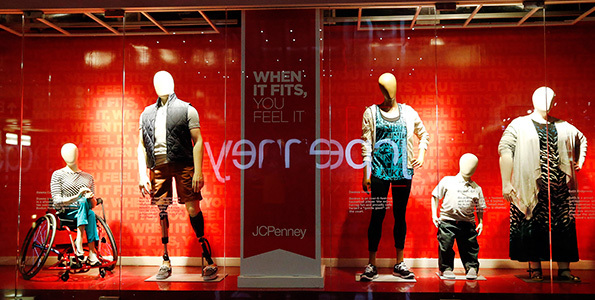 JCPenney recently took a step in a diversified direction by introducing 5 new mannequins modeled after real people. Desiree Hunter, a 6 foot 1½ inch college basketball player who was one of the models, hopes the mannequins will tell the world that “everybody’s perfect the way they are”. So instead of removing the “too thin” mannequin, Primark should show her off with mannequins who are size 28, 14, 10 and 6. That’s how to promote the message that bodies come in all sizes and shapes and they’re all good. Previous Post Should You Be Eating That? It shouldn’t be creepy if you consider that there are women who are perfectly healthy yet their hip and rib bones show just like on the mannequin. I love what JC Penny did. I’m just waiting to see if it is a one-time thing or will they continue it. Not just as a point maker in their showcase, but within the stores themselves. And not just within the respective clothing sections. Place a plus and/or dwarf size mannequin in the camping section because hey not all who camp are athletic in build. Now that would be true diversity.